Karma’s motto is to elevate your tastebuds to a spiritual level by taking you on a culinary journey of the Indian subcontinent. This discreet and smart styled restaurant is simple in design but tastefully welcoming. Karma specialises in the many regional styles of cooking that India has to offer. Head Chef Dilwar Khan brings fine training and commitment as well as a gift for modern inventions to this restaurant. The exciting menu draws on his 20 years experience as a chef in a string of reputable Indian restaurants. Karma serves delicious regional specialities in a relaxed ambience with friendly and efficient service. The restaurant is at the corner of Blythe Road and Hazlit Road, very close to Kensington Olympia Station. If there is any item you particularly like which does not appear on the menu, the chef here is happy to prepare this for you. Service if friendly and attentive without being overbearing. A short walk from the Kensington Olympia, this restaurant is a good spot for business lunches, social/family get-togethers and birthdays. 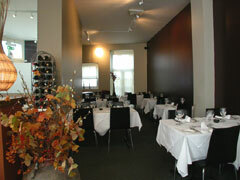 Up to 30 can enjoy dinning in the main room, or hire the whole venue to seat up to 50. There are some interesting appetizers try the crispy potato or delicious feta parcels. Then move on to the mains. A must try is the chef's signature dishes Chicken Vindaloo and Lamb Xacuti (pronounced 'shakuti'). For those of you who prefer the old favourites, there is an entire section of the menu dedicated to Traditional Classics. Karma's wine list has been specially created to complement the food. With a strong New World bias, the white wines are mainly un-oaked or mildly oaked while reds are fruit driven and the roses are smooth and juicy.